Professor Shushma Patel (Professor of Information Systems) has worked in higher education for nearly 30 years as a researcher, lecturer and as an academic leader. She is currently the Director of Education and Student Experience in the School of Engineering. In her role as a Director she takes a keen interest in facilitating students from varied backgrounds to succeed in their studies and pursue a fruitful career in Engineering. She is actively engaged in trans-national education and has worked on many EU funded projects to modernise the computing curriculum, as well as developing technologies to support student journeys within universities in Macedonia. In addition, she has engaged in developing research capacity in Uganda, for staff development and doctoral supervision. She studied Life Sciences as an undergraduate, before completing a PhD from the Faculty of Medicine, University of London. Her academic training has enabled her to lead multi-disciplinary research in computer science, focusing on cognitive informatics, integrity of data and secure systems. She has worked with SME’s on applied research projects to enable companies to exploit new concepts and technologies to maintain competitive advantage (for example, in media, technology, music and manufacturing). The projects have resulted in the development of comprehensive technology and business solutions, to propel the organisations towards new levels of success in highly competitive markets. As an active researcher, she collaborates with international partners on funded research projects and knowledge valorisation. She is actively involved with promoting equality and diversity, in particular for women in STEM, and leadership. She is a Chartered IT Professional and Fellow of the British Computer Society, and a Principal Fellow of the Higher Education Academy. 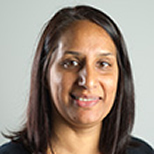 Shushma has a Level 5 CMI Coaching and Mentoring qualification. Shushma is a member of the ECU Athena Swan and Race Equality Charter panels. She has been a Trustee of the Bede Griffiths Charitable Trust and is a life member supporting projects aimed to enhance the lives of the poorest villagers through education and training, support for children and the elderly and through the empowerment of local groups, particularly women’s groups. She has been a staff governor at London South Bank University and is currently a governor at a primary school, where she chairs of the Staffing Committee. Shushma's research interests are varied with a strong emphasis on: cognitive informatics, knowledge management, decision-making, organisational behaviour, information management and information systems, in both commercial and educational settings. She has published extensively and has edited special issues of journals and conference proceedings. She has chaired and served on numerous international conferences and programme committees, and has worked on a number of research projects funded by the European Union, UK government and industry. Read about her involvement with Faber Music, in a project set to transform this traditional sheet music business. Patel, S and Wang, Y and Zatarain, O and Graves, D and Gavrilova, M and Howard, N A Survey and Analysis on Sequence Learning Methodologies and Deep Neural Networks. In: IEEE International Conferenece on Cognitive Informatics & Cognitive Computing, 16 July 2018 - 18 July 2018, Berkeley, California, USA. Patel, S Hyper Parameters Selection for Image Classification in Convolutional Neural Networks. In: IEEE International Conference on Cognitive Informatics & Cognitive Computing 2018, 15 July 2018 - 18 July 2018, Berkeley, Califormia, USA. Patel, S and Wang, Y and Valipour, M and Zatarain, O and Gavrilova, M and Hussain, A and Howard, N Formal Ontology Generation by Deep Machine Learning. In: Cognitive Informatics & Cognitive Computing (ICCI*CC), 2017 IEEE 16th International Conference on, 26 July 2017 - 28 July 2017, Oxford. Nazir, S and Patel, S and Patel, D Autonomic computing meets SCADA security. In: 16th International Conference on Cognitive Informatics and Cognitive Computing, ICCI*CC 2017, 26 July 2017 - 28 July 2017, Oxford. Gusev, M and Patel, S and Tasic, J Stimulating intellectual activity with adaptive environment (SMILE). In: The 8th Balkan Conference in Informatics, 20th September - 23rd September 2017, Skopje, Macedonia. She is a Fellow of the British Computer Society, a Chartered IT Professional (CITP) and a Member of the Chartered Management Institute. Shushma is a Trustee for the Bede Griffiths Charitable Trust.